After watching To All the Boys I’ve Loved Before, I had to read the third and final book in the series. In Always and Forever, Lara Jean takes place a year after the second book, P.S. I Still Love You. Lara Jean is in her senior year of high school with an exciting agenda ahead. A class trip to New York City, prom with her boyfriend Peter, Beach Week after graduation, and then off to her dream college close to home and with Peter is what is giving her the excitement. With that being said, not everything goes as planned for the girl who dreads change. This book was adorable! Throughout this series, we have seen Lara Jean grow so much and now it is time for her to go off to college to face all the new challenges up ahead. Lara Jean deals with first love and heartbreak, the stresses of senior year, saying goodbye to friends, and of course, sibling rivalry. Jenny Han did a lovely job of addressing teenage problems while still keeping the book entertaining. Han brings back the characters, the sweet romance, all the delicious food, and her beautiful writing style. Although the series is over, Lara Jean’s story will continue on in our hearts. All the characters have such an important role in Lara Jean’s life. They are so supportive of her and they care so much about her. Her dad who is so loving, Kitty who is so sarcastic, Margot who is a tough big sister, Chris who is spunky, and Peter who is the sweetest boyfriend and best friend to Lara Jean. All the characters have tight-knit relationships with Lara Jean. It is so important to have likable supporting characters, which Han executed perfectly. Jenny Han has stolen the hearts of so many readers. She writes lovable, relatable characters and such awesome, cute storylines. Her writing is so inspirational and shows the importance of being yourself. This book is all the things readers want in a contemporary novel. 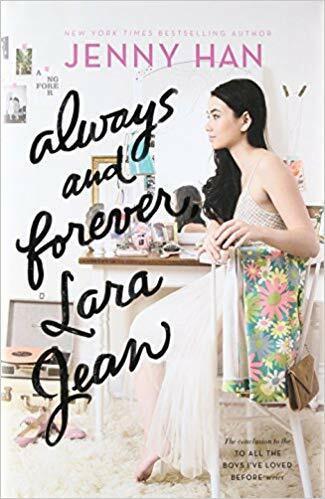 Jenny Han strings Always and Forever together beautifully, making a close to Lara Jean’s story.